Ashley Greenblatt demonstrates a parallel plié. Are you ready to hit the barre? Unique to other forms of fitness, barre exercises consist mostly of isometric (stationary) movements at high repetitions that blend techniques from ballet, yoga, and Pilates. This combination challenges the body while keeping the brain stimulated. Each exercise is designed to strengthen the core, boost balance, improve posture, and enhance your overall physique. The following barre-inspired workout can be performed from the comfort of your home. You’ll need a sturdy chair, railing, or countertop. Ideally, these items should be located near or in front of a mirror, so you can watch your form. If your muscles tremble by the end of each set, that’s normal and expected — embrace the shake! Remove your shoes prior to starting this program. Begin in a wide stance, with your feet pointed out at a 45-degree angle. Extend your arms to form a T-shape and keep them elevated at shoulder height. If needed, hold your support object (chair, railing, countertop) for stability. 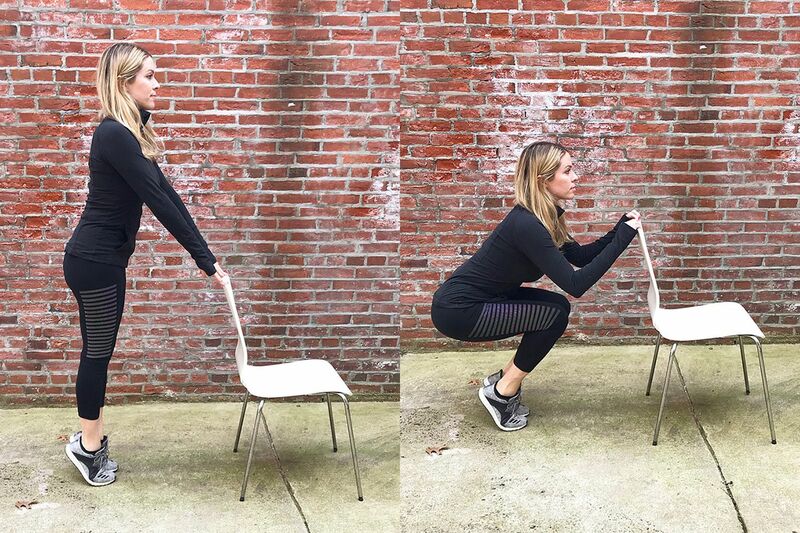 Lower your body into a squat position with your thighs parallel to the floor, shoulders stacked above hips, and knees behind toes. Gently raise your right heel off the floor, lower it, then repeat on your left foot. Continue this alternating sequence for 30 repetitions. Ashley Greenblatt demonstrates a heel-lifting plié. Begin by facing your support object. Keep your feet parallel and together. Press through the balls of your feet to elevate your heels. Carefully hinge back at your hips to lower your body, until your thighs are parallel to the floor. Keep your thighs pressed together and shoulders back. Continue to squeeze your thighs tightly together as you lift your body halfway from this position. Repeat this lower-and-raise progression for 25 repetitions. Stand with your feet hip-width apart next to your support object and rest your left hand on it. Extend your right arm in front of you, keeping your elbow soft and slightly bent. Take a deep breath, draw your shoulders back, and keep your core muscles engaged as you position your right foot in front of your left foot and point your toes. In one sweeping movement, drag your right foot wide across the floor and move your extended arm out to the side to follow it. Lower your body into a squat with your feet positioned at a 45-degree angle. Push through your left heel to bring your leg and arm back to the starting stance. Repeat 25 times. Ashley Greenblatt demonstrates a plié with tendu twist. If you want to see results, you must raise the barre.